Growing up in South Korea, Munseob Lee remembers vividly the Asian Financial Crisis because his father worked at Daewoo — the second largest conglomerate at the time that went bankrupt during the crisis. Lee added that back then, he didn’t know exactly what was happening but studying economics gave him the answer. The oil price increased because Korean currency has been depreciated. 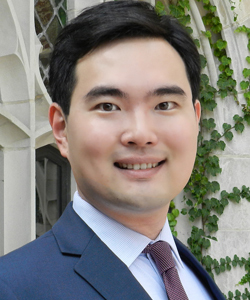 Having studied economics from the start — first at Seoul National University and then at the University of Chicago — Lee is ready to roll up his sleeves and get to work as a newly minted assistant professor of economics at the UC San Diego School of Global Policy and Strategy (GPS). When asked about working alongside leading economists and political scientists, he shared that the truly interdisciplinary environment, where quantitative researchers from across disciplines share ideas, technical expertise and a common interest in rigorous research, is beyond exciting. With many research projects underway, Lee explained in terms for the non-economist, that many business people and policymakers believe a major source of economic growth is “creative destruction,” by which newly developed products replace outdated ones. However, little is known about this type of growth empirically due to a lack of product-level data. By using big data, Lee is able to fill in the gap. He goes on to explain that by exploiting 100 billion observations collected from grocery stores in the U.S., one can verify that creative destruction is a key for growth of firms, and eventually growth of the economy. The rate is remarkably large: every quarter, eight percent of products are replaced in grocery stores. However, during the 2007-09 recession, this activity declined by 25 percent. This missing generation of creative destruction hindered the recovery. When asked about his approach to designing these types of research projects he went on to add that in many cases, controlled experimentation for firms is extremely difficult to implement or can be unethical. “That’s why we sometimes rely on natural experiments, where firms exposed to the treatment are chosen randomly by nature or institution. My research on Korean public procurement is a good example,” Lee said. He went on to explain that in order to prevent corruption, the Korean government somewhat randomly selects one vendor among a few hundred candidates for small-sized contracts. Regardless of its purpose, this system becomes a great laboratory for Lee to track the growth of randomly selected vendors, and to prove persistent effect of a one-time opportunity. As for the classroom, Lee will be teaching “Fiscal and Monetary Policy” and “The Korean Economy” this year, and he plans to bring real-world examples to the curriculum. “I strongly encourage students to participate and share their views and experiences. The classroom is a microcosm of GPS, a truly international and interdisciplinary environment. By sharing ideas, I will learn from students as much as students will be learning from me,” said Lee with a smile. He added that academic advising for graduate students is also a very important form of teaching. The goal should be a successful transition from a consumer of knowledge to a producer. Newly settled in San Diego, his impressions so far are positive. The city has great people and food, he said, though he is still waiting for the winter to see the real difference between Chicago and San Diego. My aim is to understand sources of economic growth. I exploit big data to investigate heterogeneity behind aggregated macro variables. By finding regularity from complex data, I hope to inform scholars and the policy community. I believe the job of a teacher is to provide long-lasting toolkits and engage students in creative and critical thinking. My goal is to make students think like an economist in daily life issues and real world problems. I focus on firm dynamics and its implication to economic growth.